About a month ago, I'd stopped into our local library to pick up a few books - for as long as I can remember (well back into childhood), I always grazed the craft section and the cooking section no matter what else I was currently in the mood for. This time, I picked up a book called The American Diner Cookbook, by Elizabeth McKeon and Linda Everett. As I was leafing through it that afternoon, I realized I'd checked it out previously, and likely more than once. Clearly - in spite of an ongoing promise to myself to not add to my bookshelves until I'd culled it some more - this book wanted a place in my personal library. An earlier edition of the same book was called Blue Plate Special, which may have had something to do with my not recognizing it at first. Now, diners are definitely making a comeback - both renovated older diners, and new local (and chain) restaurants with an updated, often more sophisticated diner vibe to them, and there are several cookbooks out there that reflect a 21st century take on these early and mid 20th century icons. 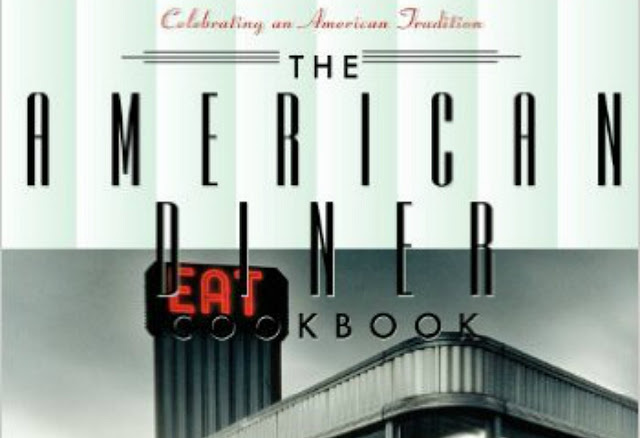 The American Diner Cookbook isn't attempting to update the classic recipes of that mostly bygone era. Instead, it is sharing recipes that many of us remember from road-trips with our parents, as well as the downhome food our mothers, grandparents and neighbors made week after week. 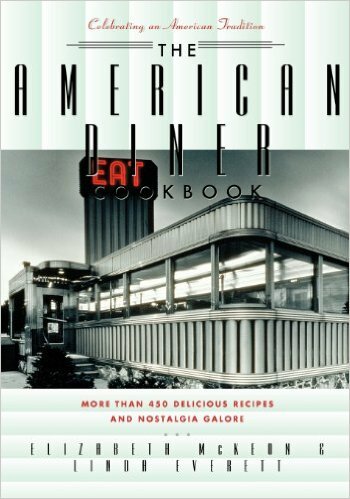 Interspersed with the 450 recipes for classic diner foods, from all-day breakfast favorites and grill counter sandwiches and sides, to Blue Plate Special meals and desserts, along with several fountain drink specialties (remember the Purple Cow?) are a couple dozen short nostalgic essays on several diners (mostly limited to those on the East Coast, sadly) . The recipes are simple, familiar, and not at all fussy, but most of them do use real-food methods rather than processed convenience foods. Many of them also reflect a much simpler relationship with spices than we tend to enjoy today, and for that reason I find myself regarding the recipes mainly as reminders of foods I used to enjoy regularly and inspirations for making my own, rather than instructions to follow meticulously. 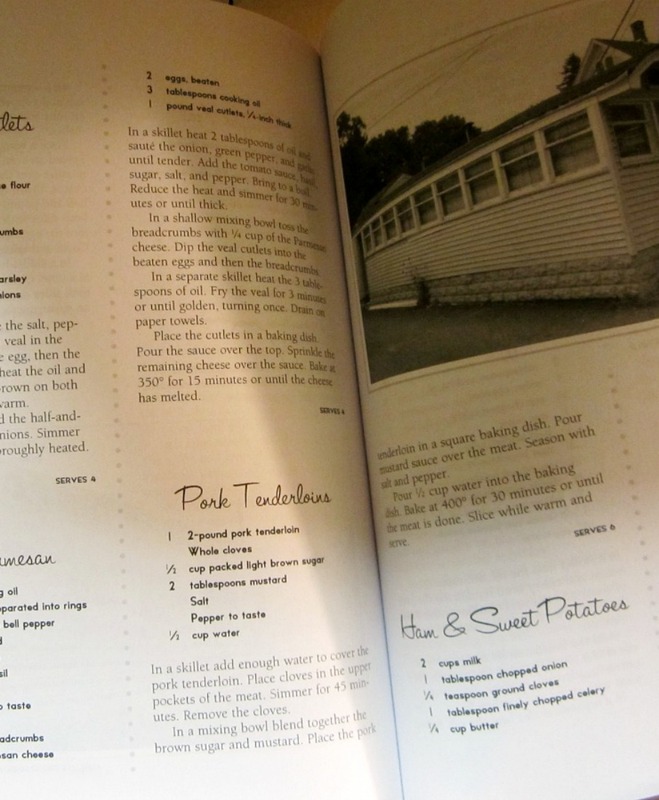 I have been doing a lot of 'retro cooking' over the last couple of weeks, all inspired by The American Diner Cookbook, and none of it anything new for me, even if I have forgotten to keep them in our meal rotation. None of them followed the recipes exactly - but when I am ready to make some homemade jelly donuts or anything else I've never tried at home, this will be my starting point. 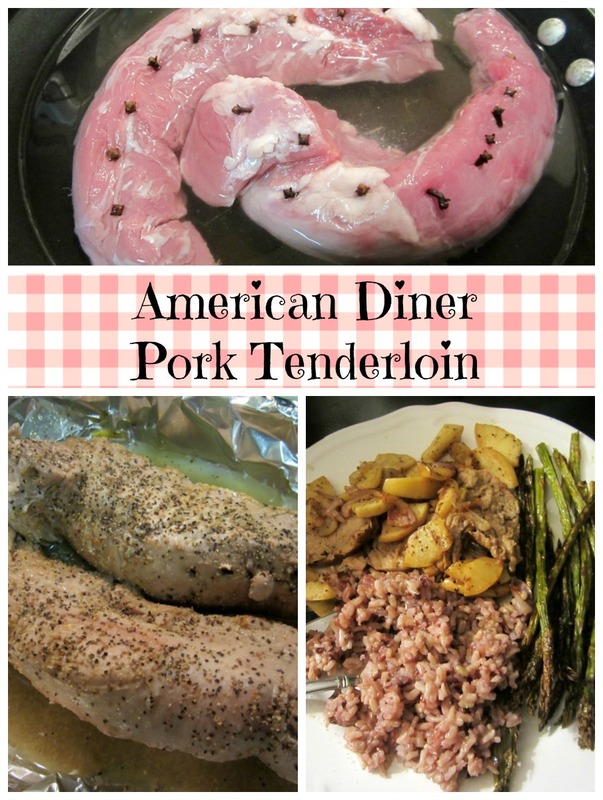 Shortly after I purchased the book, I was having a day where I had a pork tenderloin that needed to be cooked and no particular plans for it, so I decided to 'test run' the book by following their recipe (almost!). The only change I made to the printed recipe was switching the called-for brown sugar for maple syrup to avoid having to run to the store. The result is pork that is on the sweet side that takes very little work - toss it into the oven and forget about it while you go do other things. I did like the flavor of the maple syrup, but it did make for a more liquid glaze for the pork, which settled in the bottom of the pan - to keep it as a paste that will stay on the pork, I'd use brown sugar or a combination of the two, next time. In a skillet, place pork tenderloins and add enough water to mostly cover. With a knife, cut slits at regular intervals on the top of the tenderloin, about an inch apart. Insert whole cloves into the slits. Cover and simmer on med-low heat for 45 minutes. Transfer tenderloins into a shallow baking dish - because this will be sugary, I suggest using aluminum foil to prevent carbonized stuck on bits at the end. In a dish, combine brown sugar (or maple syrup) and mustard. Ideally, this should be the consistancy of a paste so that it will cling to the pork while baking. Season the pork, and spread the mustard mixture over the top of the tenderloin. Pour a half cup of water into the pan and cook, uncovered, for 30 minutes. 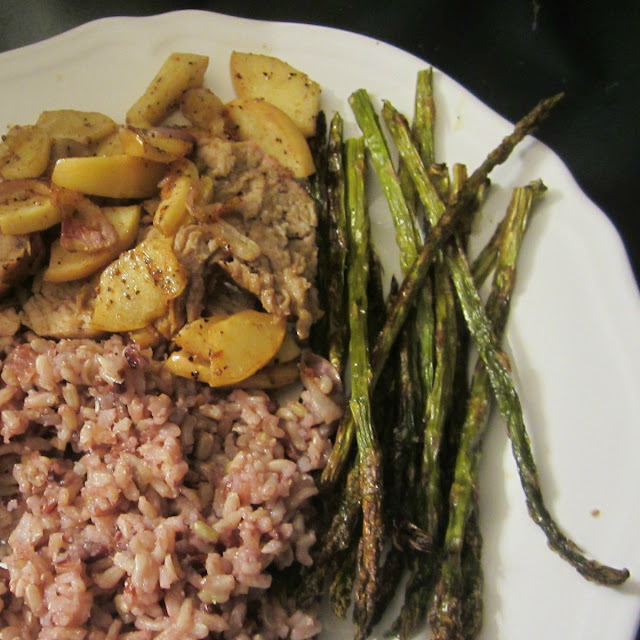 I served ours with a mixed rice blend, sauteed cinnamon apples, and roasted asparagus, and we had enough leftover pork, rice and asparagus to mixed together into a one-pan leftover 'hash' the next day. co. 1993, 2003, Cumberland House Publishing, Inc. Shared with April 2017 Foodies Read and many other fine blog link up parties. I also love going to the library for cooking inspiration! And, I also adore leftover hash from roasted pork too! Great minds think alike! Thanks for linking up with Foodies Read. I love cookbook reviews. Obviously this one does want to live at your house. Thank you Lynda for attending the #WednesdayAIMLinkParty. I shared your post on Facebook, Google+, Pinterest, and Twitter. What a great concept for a Cookbook! Sounds delicious! The craft section and cookbook section are my favorite spots in the library. Thank you for sharing at Ravenwould. Sounds delicious! Hubby smoked up porch chops tonight and we have enough left over that I will make fajitas. Thanks for sharing with SYC. What a fun book and a great recipe! Hope you are having a fantastic day and thanks so much for sharing with Full Plate Thursday. If you enjoy foodie fiction then I invite you to check out a novel called "Spoonful Chronicles". It tells the story of a woman determined to unlock the secret to her destiny by remembering everything she has ever eaten. This would be especially good to take on an imaginary road trip of inspiring meals. I like the idea of re-visiting those nostalgic real-foods. I love eating at diners, the atmosphere is so cool and hip, plus eating the yummy foods. Thanks for the recipe, I don't eat pork, but would substitute by using chicken instead.